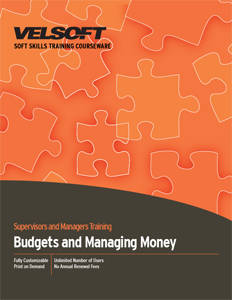 Budgets and Managing Money Training Materials is designed for trainers to develop supervisors and managers how to manage budgets in organizations. Teach how to define and understand budgets, monitoring and managing budgets, comparing investment opportunities and much more! Seeing is Believing This sample manual to teach Budgets and Managing Money is in MS Word format. Today's business climate is a competitive one. Give your students the edge they need to be successful with Velsoft's Budgets and Managing Money course. This two-day workshop will allow participants to nurture the skills they need. At the end of this training course, your students will be able to define basic financial terminology, prepare budgets and have them approved, perform ratio analysis, and make financial decisions that are beneficial to their company. You can easily combine this course with Velsoft's eLearning version (www.velsoftelearning.com) of Budgets and Managing Money for a blended learning experience. Velsoft's training packages are fully customizable and include an instructor guide, student manual, quick reference guide, PowerPoint slides, and more. Download a free sample today and take a look for yourself.